As Boston continues to grow and attract more residents and jobs, the streets of Boston will only become more congested. In addition to the classic hubs, today's Bostonians are traveling between areas of the city that would have seen very little back-and-forth traffic a century ago. It is key that new rapid transit routes are invested in to cater to changing route preferences and to spur continued development in these previously undeveloped or disinvested areas. People should be able to travel between Boston's neighborhoods quickly, reliably and directly, yet the majority of today's Boston transit routes still follow trolley tracks laid between 1890 and 1910. While such heritage is honorable, by sticking to our roots as such we fail to capitalize upon changing key travel patterns through the city. It is time we invest in better transit along such routes to mitigate the congestion taking place along them and provide people with a viable alternative to car ownership. I for Innovation. This light rail line would connect the companies, startups, consulting firms, etc. downtown with the Seaport, a neighborhood where lots of commercial and residential development is taking place and where many companies and residents have already moved. The i Line would also serve as a direct North Station-South Station connector, shuttling riders between Boston's two regional rail hubs for the first time since 1938, when service ended on the Atlantic Avenue Elevated. The trip between downtown and the Seaport is short distance-wise, yet there is currently no direct transit option. Currently, one must either switch for the Silver Line at South Station, which can require as many as two transfers if traveling from the North Station/Government Center area (Orange or Green Line to Red Line to Silver Line), or drive and struggle to find parking in the Seaport's packed parking lots. Not to mention that development in the Seaport has brought more transit riders to the Seaport than the Silver Line can handle and will only continue to attract riders as Seaport Square and other development projects are built. Additionally, there are a total of 17 private transit shuttles running through the Seaport connecting workers and residents to North Station, South Station and other downtown destinations—clearly these shuttles should be consolidated into one reliable transit service that will alleviate Seaport traffic. The i Line route with proposed stations. The i Line's route would begin in front of the Boston Convention & Exhibition Center on Summer Street. The tracks would turn left onto D Street to connect with the Silver Line at Silver Line Way Station. From there, the tracks would continue onto Seaport Boulevard, turning left onto Boston Wharf Road before turning right onto Congress Street, which the line will follow until North Station. The exception is a slight diversion towards South Station down Dot Ave and along Summer Street to connect with the multiple train and bus lines that stop there. Alternatively, to eliminate the extra trip, the trolley could continue down Congress Street with a stop by Dot Ave and an underground passageway to South Station from the stop could be constructed. At the end of the day, the light rail trains would be maintained at a new maintenance facility located off D Street built on Massport-owned vacant land. Update: Massport wants to build a parking garage on this lot: Link. Even so, there are still plenty of empty lots in the Seaport that could fit a trolley maintenance facility. The i Line's loop route around the Seaport (via Seaport Boulevard and Congress Street inbound, via Summer Street outbound) ensures that lanes can be reserved exclusively for i Line trolleys without taking too many car travel lanes away on a single road. All that needs to be done on each of these streets is to grade-separate one car travel lane, the one closest to the sidewalk, and reserve it exclusively for trolleys. Taking parking spaces away in the Seaport would have a less drastic effect than in other Boston neighborhoods, considering that there is plenty of parking available in the area. On the short stretch of Dorchester Avenue towards South Station, all four legal parking spaces would be eliminated to create an additional travel lane for cars to make up for the lane taken for the i Line. On Summer Street between Dot Ave and the Greenway, trolleys would run in the center travel lane with traffic. The center island would be widened to accommodate a trolley stop in front of South Station, slightly narrowing car travel lanes, and a lane restriction would be imposed reserving the center lanes for transit and carpools from 7:30 AM to 9:30 AM and from 4:30 PM to 6:30 PM—otherwise, the trolleys would run with traffic.. Along the Greenway, a two-way trolley reservation would be built over the currently-uncovered Central Artery exit ramp, taking minimal land from the Dewey Square Park/Plaza. Along Congress Street, a center reservation would be built at least between State Street and Bulfinch Triangle. Around Post Office Square, where the roads are narrower, travel lanes would have to be strategically eliminated—the trolley bound for North Station would possibly be routed around Post Office Square via Franklin and Pearl Streets to eliminate southbound lane elimination. Alternatively, a center reservation would be built along Congress Street through Post Office Square, reducing southbound lanes to one. Or, a radical move could be made and Congress Street through Post Office Square could be closed to cars and reserved for trolleys and a wider sidewalk/bike lane. Other options include closing Franklin and Pearl Streets to cars and routing trolleys there in both directions. Or, the i Line through downtown could be built as a subway, which would not be the first time a subway was proposed for Post Office Square. A 1914 proposal to extend the Boylston Street Subway to Post Office Square, a busy district then and now. Update: the 1914 Post Office Square subway extension proposal could potentially be used as a Green Line-i Line connection, allowing Green Line rolling stock to be used on the i Line and possibly eliminating the need for a trolley maintenance facility in the Seaport. An alternative to running trolleys on Congress Street would be to build a subway under Congress Street between the Greenway and Post Office Square, ultimately extending to the Green Line subway, and then route the trolleys through the Green Line subway to North Station. However, the Congress Street surface route would be more direct and more scenic. Even so, a Green Line-i Line subway connection would unlock the potential to directly connect the Seaport to the suburbs via the existing B, C, D and E branches as well as the upcoming Green Line Extension to Somerville and Medford. Not to mention a Kenmore-Seaport via Subway trolley could supplement or altogether eliminate the need for the proposed Back Bay-Seaport DMU line (Link). However it is built—street level or combination street level and subway—the i Line's route is a busy corridor that connects Boston's innovation and is in need of greater transit investment as the Seaport continues to grow and attract residents, companies and traffic. The s Line, an extension of the i Line into Southie. The s Line would run all the way to North Station from Southie with some trolleys short-turning in the Seaport, where riders would be able to connect with the i Line. East of Dorchester Heights, South Boston lacks convenient access to rapid transit. Currently, the neighborhood is served by a few bus lines that are overpacked during peak service times. Other than the 7 bus, which only terminates at South Station, there is no one-seat connection between Southie and downtown. Accordingly, car dependency by residents is especially prevalent along East Broadway, to the point that it is nearly impossible for residents or visitors to find parking. Solution: bring downtown-bound light rail to Southie, minimizing the need for a car and taking stress off of Southie's parking inventory. The s Line would branch off of the i Line at the D Street/Summer Street intersection, proceeding to run in a one-way loop around the East Broadway/City Point area of Southie. The line would run in dedicated reservations along sidewalks, with the exceptions of West First Street and D Street, where a two-way center reservation would be built. As with The i Line, the loop route would ensure that no one main street loses too many parking spots or travel lanes while bringing convenient transit to the entire area. Points of interests served by the s Line would include the developing South Boston Waterfront, East Broadway/City Point and Pleasure Island Park. In addition to serving residents and minimizing their car dependency, the s Line would also attract more car-free visitors to Pleasure Island, particularly as more people turn away from cars and towards transit. Additionally, routing the s Line along Day Boulevard would give city planners a chance to rethink the road's layout. Currently, Day Boulevard is very wide, which compels drivers to drive fast there on a regular basis, a significant hazard to the area's pedestrians. For the section passing by Pleasure Island Park, where Day Boulevard narrows, the trolley could be rerouted along Farragut Road towards East First Street so as to provide residents with more direct transit access and keep the parking spaces on Day Boulevard along the park. The route of the r Line through the Seaport/South Boston, Roxbury and Longwood. Routings would include Seaport-Longwood via South Boston Bypass/Melnea Cass Boulevard, Seaport-Longwood via Elm Hill Loop, Elm Hill-Longwood via Dudley Station and Elm Hill-Seaport or North Station/Downtown using the i Line's dedicated lanes. As the Seaport District continues to grow, direct transit connections with other vital districts will be key. One district that is currently a trek to get to from the Seaport and vice versa, not to mention from around South Station, is the Longwood Medical Area. Future Seaport residents will inevitably need to get to and from Longwood, be it for medical needs or jobs. A direct link to nearby Longwood currently exists, the South Boston Bypass, yet it is reserved for commercial vehicles. Accordingly, I propose building a r Line bus rapid transit line between the Seaport and Longwood via the South Boston Bypass and Melnea Cass Boulevard. Along the way, the line would travel through another transit-needy area—Roxbury—through which a feeder BRT line would be built, providing Roxbury with a much-needed connection to Longwood, downtown and the Seaport as well. Along Melnea Cass Boulevard, there is plenty of land cleared for the unbuilt Inner Belt that could be reclaimed to widen the road and construct a dedicated two-way BRT lane. Through Roxbury, Columbus Avenue is wide enough that bus lanes could be designated along the sides of the road. On Seaver Street, a center BRT lane could even be built. Seaver Street once had a wide streetcar reservation on one side and is an overly-wide boulevard through a dense residential area. Drivers frequently speed on Seaver Street at unsafe speeds well past 50 MPH—a bus lane would slow traffic to safer speeds. Along Humboldt Avenue and Warren Avenue, two lower-traffic streets, buses would not have a lane but would be given traffic signal priority to ensure swift flow. Through Dudley Square, a notoriously challenging street grid for rapid transit, the buses would simply pass through with local traffic as the Silver Line Washington Street does today, albeit with traffic signal priority—particularly at the light at Washington Street and Melnea Cass Boulevard, which the Silver Line passes through as well. Ruggles Street is too narrow for a BRT reservation and too vital as a Longwood-Roxbury connector to close to car traffic as of now—the street would have to make do with traffic signal priority. Along the Fenway, traffic is low enough that a dedicated lane is not necessary. Along Brookline and Longwood Avenues, however, bus lanes would be designated. The bus would be routed in a loop around Longwood, ensuring that less lanes are taken on any given street. Particularly challenging, however, would be Longwood Avenue, which is two-way and two lanes across at spots. Given current traffic levels, Longwood Avenue would need a dedicated lane for a BRT service to work. Accordingly, as was proposed in the 1970s, Longwood Avenue would be closed to car traffic or made one-way to build a lane reserved for buses, trucks and emergency vehicles. Once through Longwood, BRT buses would divert onto Palace Road or use the E Line's reservation on Huntington Avenue to continue back towards Roxbury and the Seaport. 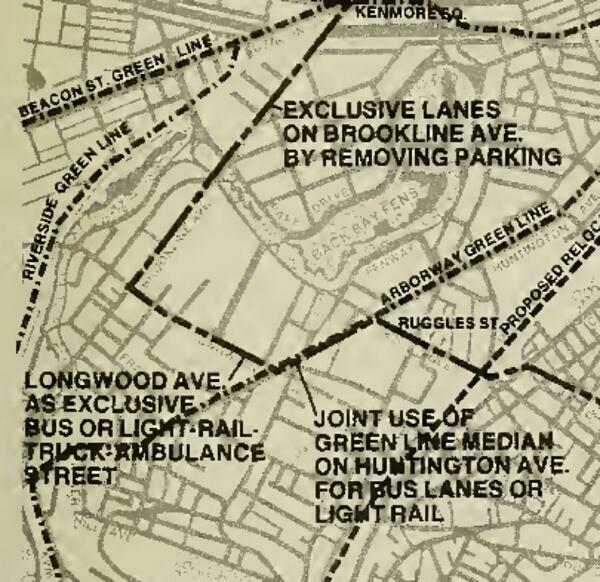 1972 Boston Transit Planning Review proposal to mitigate Longwood traffic congestion. A Bus Rapid Transit (BRT) line running from Kenmore Square to Kendall Square via BU and MIT. One of Metro Boston's most notoriously congested roadways is the traffic circle in Cambridgeport used to transfer between Memorial Drive and the BU Bridge. The circle is packed with drivers during rush hours, mostly trying to get to and from Harvard, MIT, Kendall Square, BU and other destinations on either side of the Charles. The Cambridge-side circle as experienced by me behind the wheel of a rental car at rush hour. Took at least 10 minutes to get onto the bridge! Imagine if all of these drivers were on one transit vehicle. The trip would sure be quicker! Consolidating all of the drivers that spend as much as half an hour per day or more sitting in this traffic circle and the one across the bridge in Boston (Mountfort Street) onto a rapid transit line would save lots of time for everyone involved along a route that connects two centers of innovation in Boston—BU and MIT/Kendall—and make the surrounding environment safer for pedestrians and bikers who commute between Boston and Cambridge and travel along the Charles. Ideally, a trans-Charles rapid transit line would run along the Grand Junction Railroad. However, Cambridge is hesitant to run regular transit service along that ROW, and the tracks and bridge would cost millions to rehabilitate. A simpler, cheaper-to-implement solution is to run street level rapid transit between Boston and Kendall Square via BU and MIT. The route would be served by articulated buses that would receive signal priority and, when possible, run in dedicated, grade-separated lanes--bus rapid transit. Implementing rapid transit along the Kenmore-MIT route will not be easy. Many of the streets, particularly the BU Bridge and the its enter/exit routes, are as narrow as one lane wide as is. The only feasible way to implement rapid transit along this viable corridor is to impose lane restrictions along the way. During peak travel hours, the BU Bridge should be open only to BRT buses, carpools, private buses (e.g. Bridj, charters) and work vehicles. As it is, the BU Bridge and surrounding infrastructure are not well-designed for the current traffic levels—the space is simply too narrow, and accordingly traffic backs up significantly. Rather than invest millions of dollars in widening the infrastructure, the cheaper and more logical solution is to modify the infrastructure's user input. From the hours of 7:30 AM-9:30 AM and 4:30-6:30 PM, private cars that are not carpools (4+ passengers) would not be allowed to cross the BU Bridge. One lane wide on the Boston-side BU Bridge entrance/exit, which grows extremely congested at peak travel times. One spot where new infrastructure would be necessary—a contraflow lane between Carlton Street and the BU Bridge entrance reserved exclusively for buses. Such a lane would be relatively cheap to implement and would speed buses up by eliminating the trip via Comm Ave. The lane would be a continuation of dedicated bus lanes built on Mountfort Street between here and Beacon Street. Alternatively, Mountfort Street could be closed to car traffic at the same times as the BU Bridge. Ultimately, the route would not be true BRT. Considering that Vassar Street and much of Kendall Square along the Kenmore-Kendall via BU Bridge route are also one lane, implementing true BRT would be impossible without closing the streets to car traffic. The k Line service would be more akin to the Silver Line—not true BRT, but a well-planned, optimized bus route that is much quicker than a regular bus. Vassar Street does not get particularly jammed up at rush hour—the bus would still run relatively fast without a dedicated lane, particularly with the installation of traffic signal priority at intersections along the way. Constructing the k Line would also be a prime opportunity to do something about the dangerous turn onto Vassar Street from Memorial Drive—ideally install a light that would give buses signal priority and make the oft-used turn onto Vassar Street much safer. A light could also be installed on the other side of the Memorial Drive overpass that could stop oncoming traffic when a bus is about to merge onto Memorial Drive from the BU Bridge, ensuring that the buses, which will be long articulated buses, do not run into problems when switching lanes to turn onto Vassar Street. The Kendall-Ruggles via Longwood feeder bus route. The Coolidge Corner-Kendall via Longwood feeder bus route showing a possible extension to Cleveland Circle via the C Line's reservation. The BU Bridge closing, as well as the entire Cambridge section of the route, could ultimately be supplanted by a line along the Grand Junction Railroad. However, unless it fares unpopular or counterproductive, there would be little reason to remove the k Line service or open the BU Bridge back up at rush hour—that would only encourage people to drive again, and the buses would serve areas that the Grand Junction ROW does not serve—Roxbury, Longwood, Kenmore, BU East and Brookline. Ultimately, the k Line would alleviate traffic congestion on many existing transit resources—the Harvard/Mass Ave Bridge, the Red Line, the B Line and the 66 Bus, to name but a few. By eliminating cars, and particularly if the k Line is built as an articulated trackless trolley route, the k Line would also contribute to the quality of air around the Charles River. 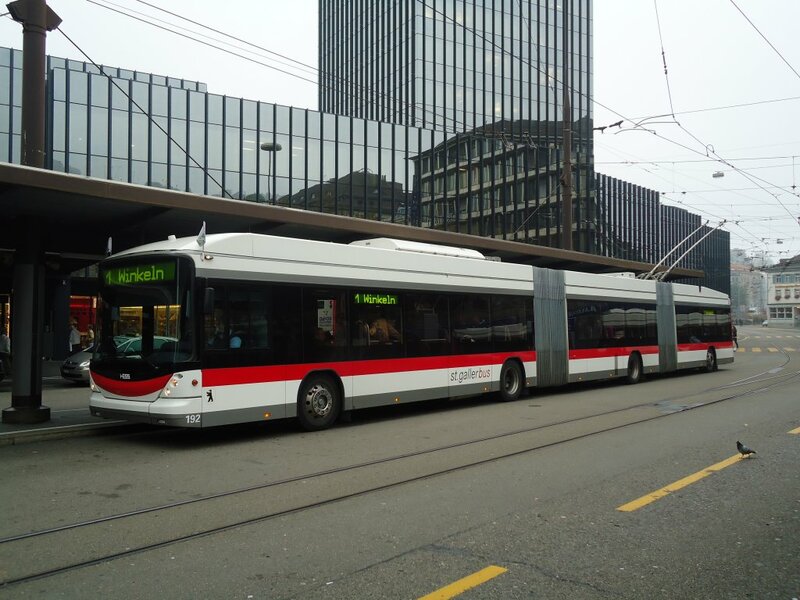 An 80-foot bi-articulated trackless trolley suitable for the k Line in Saint Gallen, Switzerland. Image taken from bus-bild.de. The protected bike lane's route along Beacon Street and Comm Ave between Allston and downtown. This last route is not a rapid transit line but a bike lane. Running from Beacon Hill to Allston, this route would vastly improve the safety of biking in the Back Bay. Currently, Beacon Street in the Back Bay, at three lanes wide, is much too wide for a dense urban residential area full of pedestrians. Drivers reach 40 MPH + effortlessly on Beacon Street, endangering surrounding bikers and pedestrians. As of now, there is no bike lane along Beacon Street in the Back Bay, a gaping lack along a viable bike corridor. Running from Beacon Hill to Kenmore Square, Beacon Street connects innovation in Boston University and young residents of Allston, Brighton and Brookline to jobs downtown. By encouraging biking along Beacon Street, tailpipe emissions could be cut significantly. In addition to commuters, people headed to the Esplanade would be much more likely to bike there as opposed to driving if biking was safer. The current layout of Beacon Street in the Back Bay, barely a block away from the Esplanade—one way and three lanes wide with parking on both sides and no bike lanes. 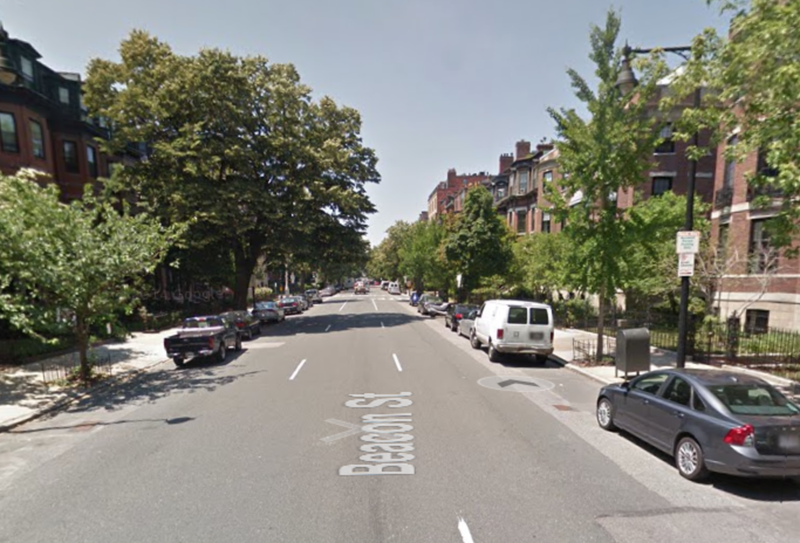 Accordingly, I propose constructing a curb-separated two-way bike lane along Beacon Street in the Back Bay. The lane would run along the sidewalk and be completely separated from traffic, ensuring bikers are as safe as possible. There would also be bike traffic signals along the bike lane, deterring bikers from running red lights. A total of one travel lane would be lost along Beacon Street, decreasing travel lanes to two and slowing traffic down to safer speeds. Parking could be conserved—a new parking lane could be built along the bike lane. 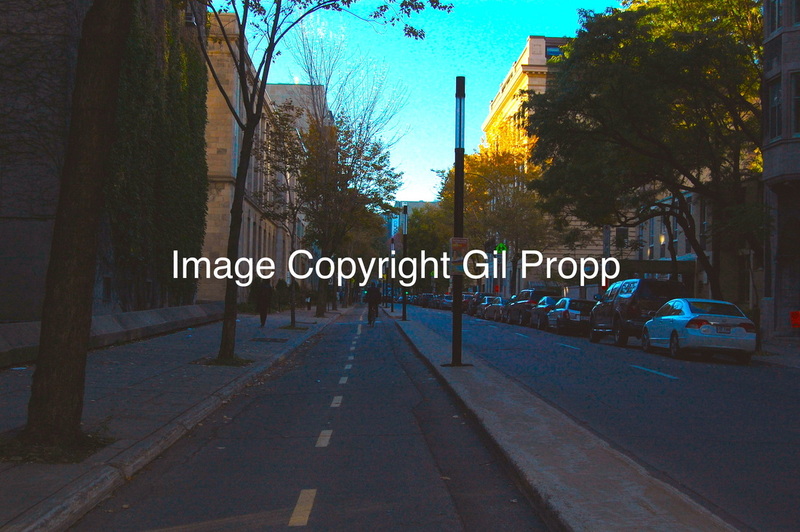 A curb-separated two-way bike lane on the one-way University Street in Montreal, QC, Canada, by McGill University. From Kenmore Square, the separated bike lane should continue along Comm Ave and Brighton Ave to Union Square in Allston. Potential improvements to Comm Ave's bike infrastructure have been analyzed in detail by Ari Ofsevit on his blog Amateur Planner: http://amateurplanner.blogspot.ca/2014_08_01_archive.html. By narrowing or eliminating car travel lanes as well as slightly narrowing the B Line's center reservation, space could be made for a safer bike lane along the sidewalk in an area with high existing bike usage and many college students who could benefit from safer biking and more affordable ways to get around. The bike lane on the Comm Ave Bridge over the Mass Pike (next to "Fuller's Corner"). 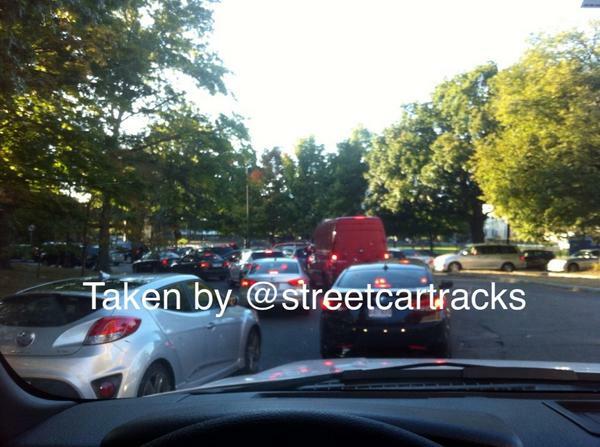 Currently, the lane's setup is dangerous—in between two car travel lanes—and scary for bikers. A protected bike lane would be much more welcoming to bikers and would encourage biking around BU/Allston. Along Brighton Ave, another area with a high student percentage, the center landscape reservation would be narrowed or removed entirely and travel lanes would be narrowed to 10 feet wide to accommodate a curb-protected one-way bike lane on either side of the street. The current arrangement on Brighton Avenue—bikes share a lane with cars, trucks and other traffic. Beacon Street, Comm Ave and Brighton Ave should jumpstart a safe biking revolution in Boston. Other high-traffic streets in Boston with surrounding resident age and/or income demographics that could significantly benefit from future protected bike lanes include Columbus Avenue/Seaver Street in Roxbury, Dorchester Avenue, Blue Hill Avenue and Huntington Avenue.